The images on Robin’s website caught my eye. 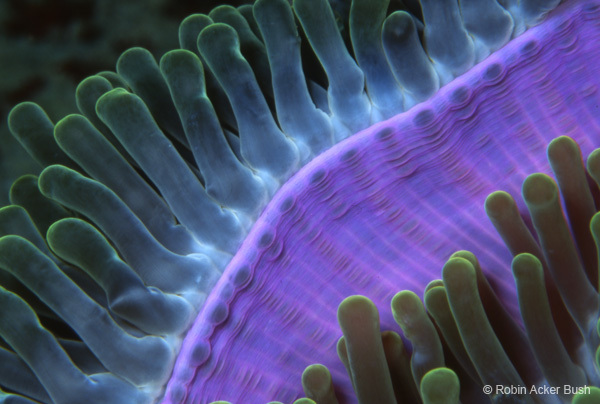 Magical close-ups of sea life with rich patterns, textures and colors. Even though they are still images they seemed to move. I had to contact Robin to learn more. My images are exact reproductions of the real world. The color is natural. There is no manipulation of the image through technique. You are seeing this Purple Base Anemone in extreme close-up (the subject you see here was less than 2 inches in size). In this view, the anemone was lifted by an unusual wave that revealed the purple underside to me, once, for a fleeting moment. I made this image in the Solomon Islands (South Pacific). Why do you think your images would work well in a healthcare setting? We’re doing something very different from the traditional way nature is brought into healthcare settings. Healing is a blend of the powers of mind, body and medicine. Our close up images encourage a sense of wonder at seeing the smallest miracles of nature. They are a profound metaphor for healing. They illustrate the beauty, power and importance of starting small and building toward the health of the whole being. In this way Nature provides inspiration that engages our minds, soothes our spirits, lifts our hearts and helps us heal. Caregivers too benefit from working in spaces that resonate deeply with the inspiration of nature. Our images help us to see the “extraordinary” in our world and in each other and foster collaboration and innovation. Keeping caregivers and administrators inspired is an important, and often forgotten, aspect of healthcare. Our work serves them as well as the patients and their families. Which of your custom design products would be of interest to designers of healthcare interiors? In healthcare interiors we look to soothe the senses and encourage discovery. Water walls can be created in enclosed cases where water flows over an image (single sided, or dual sided as room dividers). Where noise is a concern, we can produce the imagery as acoustic panels for walls or as acoustic backed stretched fabric ceilings that absorb noise to create a more peaceful environment. The images can be backlit and built into walls of backlit translucent stone or acrylic for soft lighting. Immersive projected environments can be created in 2-D and 3-D.
“Peek holes” that depict 3-D natural scenes can be created along walls to give children places to discover. There are grand format murals that can cover extremely large expanses and the graphic patterns from the image repeated in etched glass elsewhere in the space. The opportunities are endless. We provide both technical and creative expertise but ultimately we work to fulfill the designers vision. Alex Liberman was a mentor of yours. Tell me about him and how he influenced the way you see. You have a long term commitment to preserving the environment. Do you hope that your art might motivate people to protect the environment? My career has been dedicated to using art as a lens through which to focus public attention on environmental preservation. By providing people with images they can feel passionate about, I feel I can instill in them a desire to protect the natural world they love. Today our imagery in a space also functions on another level. It becomes a powerful messaging tool in communicating the sustainability mission of a business to its suppliers and clients. Sustainability is not just about which materials are used, or how they are used, it is about why we are making the choices we make, and our natural images express the “why.” They bring the reason for the sustainability position, protection of the natural world we love, into our personal experience. Your degree is in Environmental Documentary Film Production. When did you make the transition to fine art still images? Why the change? Do you still do both? I began photographing underwater alongside building my Environmental Documentary Film Production business. I had the vision for using my still imagery as architectural and interior design materials long before it was possible. Now technology has caught up with my dream. Today we can create almost anything. We can produce a still image using “green” printing technologies on organic substrates with no VOC inks, or we can blend still imagery with lighting, sound, motion imagery, and 2-D and 3-D projection techniques to create immersive environments. All the skills, from graphic design to still photography, from film producing to creating today’s multi-discipline high-tech installations, complement each other and help us to assist the design team in creating something truly extraordinary whether it be a single table or a six story atrium display. While working for The Nature Company you produced a 50-minute video depicting the beauty of water. Have you considered producing similar videos to be used in healthcare settings? Years ago, National Geographic and Jacques Cousteau were the pioneers in environmental documentaries and they brought us a world most of us had never seen. Over time, nature has become a well covered topic. It’s hard to find a subject or a species that hasn’t already been beautifully filmed. Although I would certainly welcome the opportunity to produce more inspirational nature videos for healthcare settings, I think the future lies in more innovative installations, of which video is a component. Now we have the technology to turn entire interior or exterior spaces into experiences that engage the hearts and minds of all. Let nature be your inspiration. Create the kind of world you dream of. I’ve had the benefit of seeing Robin’s images up close! Beautiful work and very passionate about what she does! She is very inspirational! Great post and wonderful work Robin! 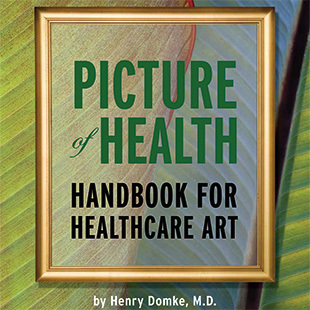 When yours and Henry’s close-up imagery is reproduced in large prints for healthcare, I think two things make them magnetically intriguing for the viewer: 1) the small things are reproduced much larger than life size – something the human eye and mind can’t accomplish without magnification. We recognize the fine structures with fond familiarity, but are drawn to the intricacies as if seeing them for the first time with real clarity. 2) Seeing your vivid images of small things in a healthy state of growing and flourishing somehow resonates with the healing process we intuitively sense is happening inside us at a cellular level. The same forces of nature that heal us are evident in the vitality of your images. Very inspiring work from you both!